Depending on your perspective, the collapse of the American Alliance of Football is either shocking or entirely predictable. Let’s start with the predictable side of things. Though many leagues have tried to fill the supposed spring void that exists on the pro football calendar, there’s absolutely no indication that spring football is something American sporting consumers actually want. The USFL came the closest to making a go of it, but that was more than 30 years ago. Since then, the XFL and UFL were run straight into the ground, with only red ink to show for their legacies. That’s exactly the same place the AAF has come to rest. The AAF’s business model depended on demand that simply isn’t there, which should have been obvious to everyone long before the league got off the ground. What’s shocking is that, given that everyone understands how incredibly difficult it is to create a sustainable alternative pro football league, the Alliance somehow got into business underfunded and unprepared for the challenges of lasting even a single season. Founded by former NFL executive Bill Polian and TV producer Charlie Ebersol, from the outside the Alliance appeared to be well-organized with impressive people in key positions. It had a TV deal with CBS, some slick imaging, a few new business ideas and a boundless amount of confidence that this could work. So much so that, within the football world, there was a reasonable amount of expectation that the league would make a go of it. What’s clear now is that the AAF didn’t have the funding it claimed would sustain the league through three seasons and that its business model was unsustainable. In other words, the AAF wasn’t everything it claimed to be. The only thing more head-scratching than a league being here and gone in eight short weeks is the fact that there’s another one on the way. How this is going to be any different than any other failed attempt at spring football is difficult to fathom, especially when most people seemed to think the AAF had a much better shot than the XFL of making things work. The XFL – unlike the Alliance – is based mostly in markets where there are NFL teams, places like New York, Dallas, Tampa Bay, Seattle and Houston. And with NFL chatter continuing from the Super Bowl through the combine, free agency, draft and spring mini-camps, there's no shortage of NFL subjects for football fans to dive into year-round. Every spring league is built on the myth that when the Super Bowl is over, football fans feel a void in their lives. But the truth is that even for a lot of people who love football, by the start of February they’ve had enough. By then you’ve had the fall college and pro seasons, bowl season, the NFL playoffs and the Super Bowl hype. Suggesting people are most hungry for football after the Super Bowl is like saying people must be most hungry after Thanksgiving dinner because we saw how much they like food. It’s going to take at least one more experiment to drive that point home. While the football fraternity never celebrates when job opportunities for players and coaches disappear, the collapse of the AAF is undoubtedly good news for the CFL. Although the CFL was never at risk of losing its star players to the AAF, the new league had become a significant obstacle when it came to signing new players. The AAF offered players three-year contracts for $70,000, $80,000 and $100,000 (U.S.), far more than virtually any CFL player earns during his first three years in the league. (The AAF regular season was just 10 games, compared to 18 in the CFL). Over time, that would have had a significant effect on the quality of talent in the league. There was also concern that the AAF could have become a drain on CFL coaching and management talent. Meanwhile, CFL teams were scrambling to add names to their respective negotiation lists when the AAF collapsed on Tuesday. 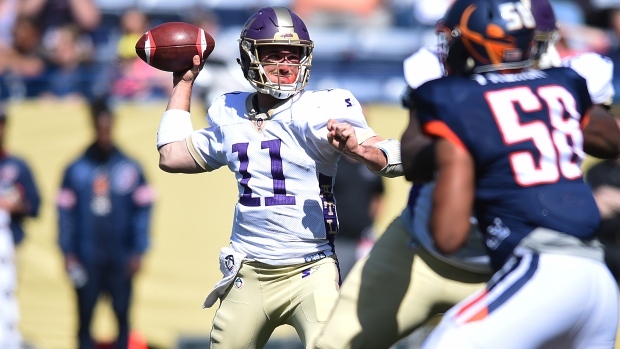 The AAF was scouted by CFL teams who now have a pretty good idea of which players they might like to sign. The XFL had some influence on the CFL this week with the departure of Ottawa offensive co-ordinator Jaime Elizondo for Tampa Bay, where he will work under former Montreal and Toronto head coach Marc Trestman. There’s reason to believe that the relationship between Elizondo and Redblacks management never recovered from his being denied the opportunity to interview for the Saskatchewan head coaching vacancy that was created by Chris Jones’s departure for the NFL. With his contract due to expire at the end of this season, Elizondo couldn’t say no to more money and a two-year term in the XFL (who knows what happens to that term if the XFL folds before its completion?). The fact that the Redblacks had been stripped of so much offensive talent during free agency would only have made his decision easier.